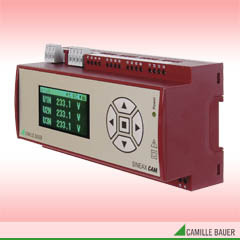 SINEAX CAM-POWER is designed for measurements in electric distribution systems or in industrial facilities. Its modular design allows it to be adjusted to individual applications and information requirements in an optimum fashion. The high-performance measuring system is capable of determining the current network state, additional load by non-linear consumers as well as the overall load of the supply system. Consistent measurement also guarantees that every network change is reliably acquired and included in measured data and extreme value storage. The basic accuracy amounts to 0.1% (U, I) or 0.2% for other variables. The programmable acquisition period and the high sampling rate make the device also suitable for the acquisition of special input signals with variable sampling intervals (e.g. zero-crossing controls), altered sine shapes (e.g. phase-angle controls) or strong distortions. The optional I/O interface may be individually adjusted to all requirements. Up to 4 groups of terminals are available. One of 5 possible functions may be assigned to them respectively.